James (age 8) is a middle child in a family of five. His father went to prison for multiple domestic violence related charges perpetuated against different women. Growing up, James watched how his father expressed anger or dealt with conflict, and he learned to express himself in similar ways. James has been told by adult figures in his life that he is just like his abusive father, and in turn he often struggles with his self-image and worth. Through support group, individual therapy, and additional help at his current school, James is learning to develop a new sense of self, and healthy ways to express his emotions. James painted a home. His family moved often to escape his abusive father. 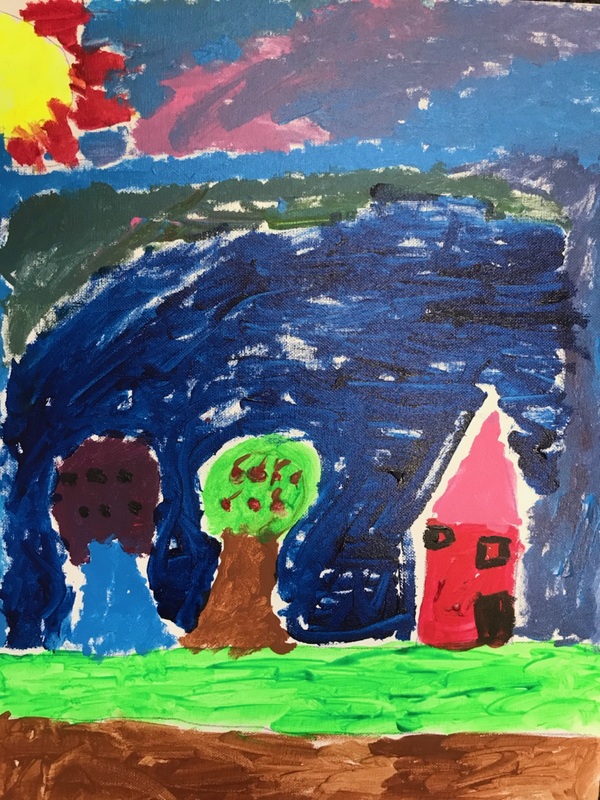 James dreams about having one safe home for his family where he can go to the same school for many years, make friends, and have neighbors that he is also friends with. Support fresh starts and purchase this art piece for a suggested donation of $20.